Even as the sun shines on both the just and the unjust, St. Mary of Sorrows overlooks both the restful expanses of Martin Luther King, Jr., Park and the incessantly droning Kensington Expressway. Its 235foot, multi-tiered tower proclaims the landmark, balancing the distant Niagara Mohawk Building on the Genesee St. axis (laid out by Joseph Ellicott in 1804), and commanding its own East Side neighborhood. To evoke the congregation's German heritage and traditions, architect Druiding was inspired by Worms Cathedral, an outstanding Romanesque monument in the Rhineland. He borrowed pilaster strips, arched corbel tables , and round-headed arches, transforming the polygonal apse at Worms into the projecting, gable-encrusted vestibule at the entrance to St. Mary's. To manifest the congregation's new homeland, he built of local Buffalo Plains blue limestone. Dreading used rustication to accentuate the building's mass and monumentality while adding turrets and other timely touches to give visual delight. The church is laid out as a Latin cross (length, 204 feet; width through transept, 104 feet). The interior is bright and spacious. Light from the stained glass windows, which include representations of the Seven Dolors, or sorrows (of the Virgin Mary), plays over the wide-spanning arches on slender monolithic columns and illuminates the ribbed vault. In 1947, a workman's blowtorch started a three alarm fire which spread rapidly through the roofing timbers. The walls and windows, including the great rose windows in the transepts, escaped major damage, but the interior was severely damaged. Undaunted, the congregation carried out a $500,000 restoration crowned by the splendid polychrome slate roof and a wind vane of the angel Gabriella, trumpeting the resurrection. The years 1891 and 1947 are key dates in the history of St. Mary of Sorrows, but 1986 may be the most critical of all. Despite St. Mary's significance within the urban scene (both aesthetically and as a visible manifestation of moral and ethical values), it is threatened with demolition. This possibility raises questions of our civic and moral responsibilities and requires that we reflect on our obligations to past, present, and future generations. APSE. The vaulted semicircular termination of a chapel. ARCHED CORBEL TABLE. A projecting course of masonry supported by corbels connected by arches. CORBEL. A projecting block supporting a beam or other horizontal member. PILASTER STRIP. A flat, rectangular, vertical member projecting from the wall of which it forms a part, without a base or capital. ROMANESQUE. An architectural style of the 11th and 12th centuries characterized by the revival of Roman vaulting. ROMANESQUE REVIVAL. 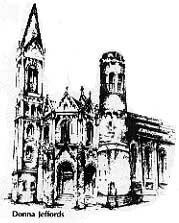 An architectural movement in the 19th century associated with H.H. Richardson and exemplified by his Buffalo State Hospital, 1870ff. RUSTICATION. Wall treatment with rough, naturalistic blocks and recessed joints. TRANSEPT.. The arms of a cross-shaped church. TURRETS. Small towers or ornamental structures at the angles of larger structures. 1986 Preservation Coalition of Erie County.